It feels like I haven't blogged in ages. Reason being, the last three posts were all written about 2 weeks ago when I was working my desk job. I got a little ambitious and decided to get ahead on the whole blogging thing, told myself that I was going to stay on top of it from there on out, and well, here I am, the night before a post is due to go up, writing about a manicure I did awhile ago. I'm not complaining, but I'm not going to lie, it was amazing not having to worry about writing posts! At least for this post, I was ahead of the curve and had the photos already edited. 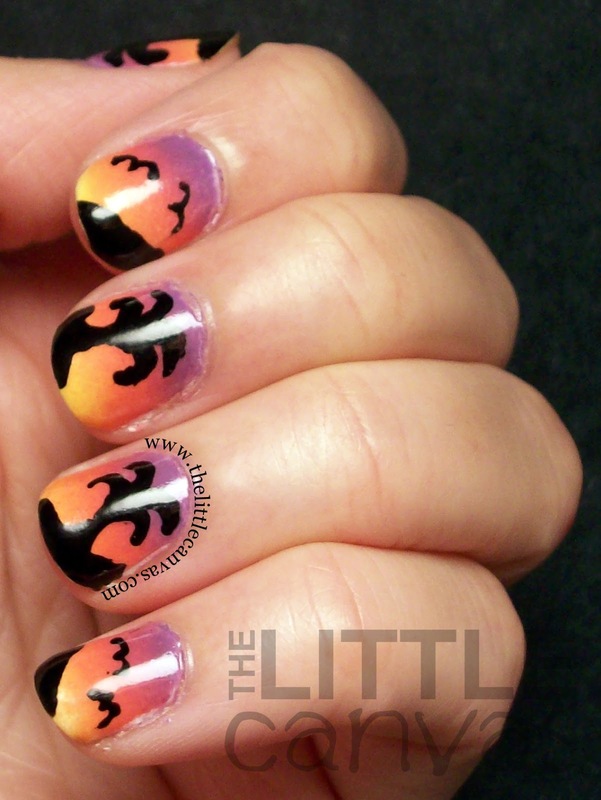 I wish that I had gotten photos of these nails in the sun, but they do look rather amazing with the black, lightbox background! Last year, I did a similar manicure where I created a sunset gradient and then used black to draw palm trees, beach french tips, and some little seagulls! I really loved the manicure, but hated how my black tips covered the tips of the pretty gradient. This year, I was more cognizant of the gradient, and made sure that the tips still were showing. Oh, how I loved this manicure. Let's take a look! Amazing, right? It looks just like a gorgeous sunset with the purple, coral, and yellow. Best thing, this look is rather easy to obtain!!! Just as with any gradient, I started out with a thin coat of a white polish. I can't remember to be honest what white I used, but I used a thin coat of one. When that was dried, I painted the gradient onto a make up sponge and then dabbed the sponge onto the nail. When i got the coloring I wanted, I added a thin coat of top coat to blend the gradient. 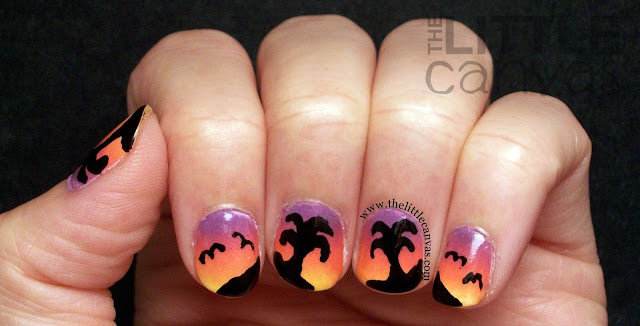 When that was dried, with a nail art brush, I added the details of the palm trees, beaches, and seagulls. Added another coat of topper and they were done! I decided to use all Ulta polishes for the gradient because my OCD set in and I wanted to see if there was a difference if you blend three of the same brand versus three different brands. Crazy, right? To be honest, I saw no difference. I didn't feel as bad using the Ulta polishes because I purchased all of them for $2 so if I used a little extra, I wasn't using up an OPI or China Glaze. If that makes any sense. It makes sense in my brain, but probably not down on the blog. What do you think? 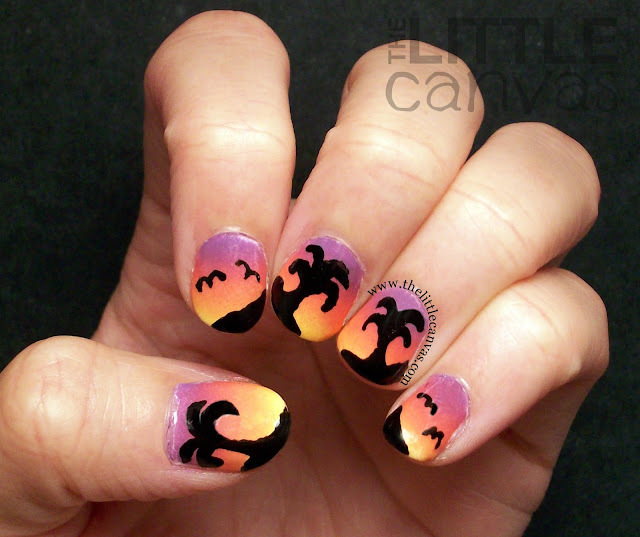 Liking the summer beach sunset look? I should do a night time one....ooo it'd be pretty!